As warmer weather rolls into town and you're using your air conditioning more and more, you may be surprised someday to see ice on the outside of the unit. This may seem crazy. Air conditioners are supposed to cool the inside of your house. So why does the outside look like an old frosted-up freezer? To be fair, you shouldn't blame the air conditioner. It's just doing its job. The real problem is you—or, more specifically, your lack of maintenance. You've probably let the coils get too dirty. It's also possible the unit has a leak and needs to be repaired and refilled, or you're simply setting the temperature too low (or the fan too low). The first problem could be that the air cooling coils are blocked and need cleaning. A buildup of dust, dirt, and other crud blocks the airflow that allows the heated coils to cool. Without the proper airflow through the coils, the unit heats up and the cooling capacity decreases. Another problem is that the moisture accumulated between the cooling coils isn't blown out of the coils, and the coils freeze up. The solution to blocked coils is a good cleaning. This requires removing the window air conditioner unit from the window, taking off the front cover, and removing the outer metal jacket to access the interior parts that need to be cleaned. Bring the unit outdoors and spray the front and rear coils with an air conditioner coil cleaner, following the manufacturer's directions. Rinse the coils with a hose, if necessary (some cleaners are "self-rinsing," but make sure the coils are clean before you skip the rinse). Wipe off the fan blades on the large fan at the rear of the unit. If the coil fins are badly bent, straighten them with a fin comb. Finally, be sure to clean the filter at the front of the unit. The filter helps keep the coils clean and should be checked and/or cleaned monthly during the cooling season. The second potential problem is that the air conditioner has a slow leak and is low on refrigerant. This causes low flow within the unit, and although the unit does cool, it is not working efficiently. The refrigerant used on older air conditioners was Freon (bad for the earth's ozone layer), but newer models have more environmentally friendly formulas. In any case, the U.S. Environmental Protection Agency (EPA) prohibits "topping up" of refrigerant, as was done in the old days. Low refrigerant indicates a leak, and the EPA requires that leaks be found and fixed by a certified technician before the unit can be recharged with refrigerant. A couple more things might bring the second ice age to your little cooling appliance. Running the fan on low while the temperature setting is low can freeze the coils. In most cases, you should run the air conditioner on the medium or higher setting to allow enough air flow through the coils. The only time you should use low fan setting is when the humidity outside is unusually high and the air conditioner is having a hard time keeping the room dry. Lower airflow through the system can help the unit dehumidify more effectively. Finally, you may simply be setting your air conditioner too low. 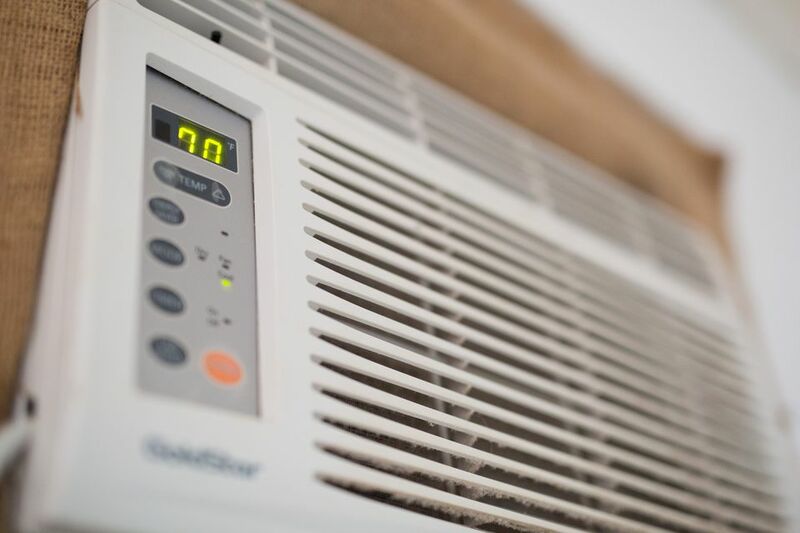 As a general rule, air conditioners are designed to cool most efficiently to about 68 F. They can go colder, but setting the temperature way down can cause the unit to freeze up. Frigidaire Casement A/Cs Are Pricey, Icy Beasts. Should You Buy? What Size Window Air Conditioner Do I Need? Why Choose a Whirlpool Front-load Washer?